Kimchi is a living food like wine and cheese; the older it gets, the deeper its taste develops. 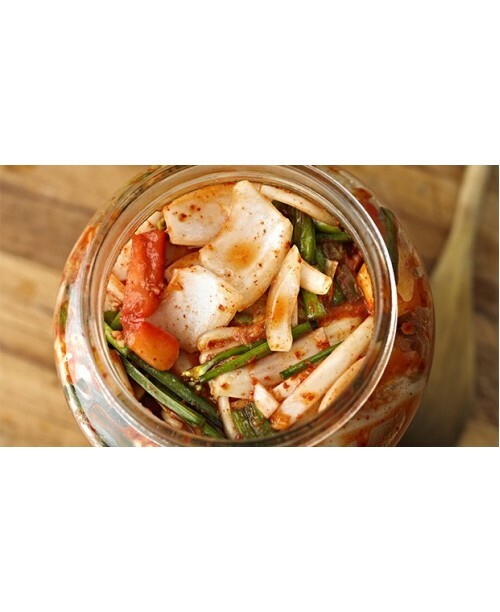 Kimchi preserves nutrients, prebiotics that are already in fresh vegetables while it self-generates probiotics. Health functionality of kimchi includes anticancer, antiobesity, anti constipation, colorectal health promotion, probiotic properties, cholesterol reduction, fibrolytic effect, blood sugar regulation, antioxidative and antiaging properties, brain health promotion, immune promotion, and skin health promotion. Dont forget to select your choice from various options given under "options"